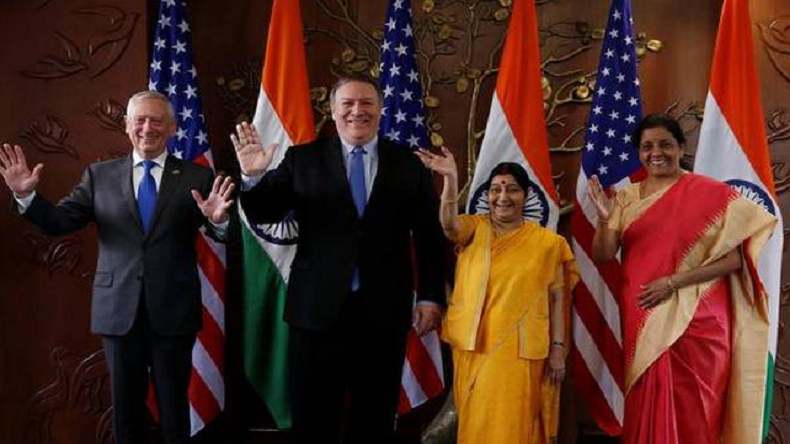 On Thursday, both the US and India signed a long-pending Communications Compatibility and Security Agreement (COMCASA) and agreed to set up of a hotline between external affairs minister and defence minister with their American counterparts. The agreement will allow India to install high-security US communication equipment on defence platforms which are being sourced from the US. India’s Defence Minister Nirmala Sitaraman and Minister of External Affairs Sushma Swaraj on Thursday held 2+2 dialogue with the US Secretary of State Mike Pompeo and Defence Secretary Jim Mattis in Delhi. In the crucial military and political meeting, delegations from both the countries discussed many important issues to strengthen India-US relationship including the historic Communication Compatibility and Security Agreement (COMCASA). After the signing the COMCASA agreement India will get the advanced encrypted military technology and hardware from the counterpart country. In 2016, the United States had designated India as a major defence partner after Indian Prime Minister Narendra Modi had met US President Donald Trump. The Communication Compatibility and Security Agreement (COMCASA) allows 2 countries to share end to end encrypted communication and data. The COMCASA will give a legal framework to India and USA to share the defence technology. What are the benefits of signing COMCASA? The Indian Navy will now get the instant information about the presence of Chinese warships or submarines in India’s territories and the encrypted data will be received at the Naval Headquarters after the US satellite detects it. The decision of signing COMCASA will help India to acquire Sea Guardian drones, which can detect and target the enemy warships.